Attention enthusiasts of great singing! On Sunday, January 23, from 1 to 1:30 pm, superstar tenor Lawrence Brownlee will be at Amusements, the McCaw Hall gift shop, to sign copies of EMI Classics' newly released CD of Rossini's Stabat Mater. In December, in newspapers across the country, the Associated Press said that in this recording, Brownlee "at moments even surpasses the late Italian superstar" Luciano Pavarotti. 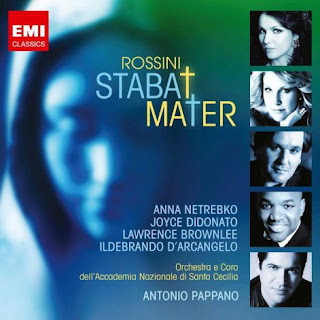 CLICK HERE to read Verena Dobnik's review of the recording, which features Brownlee, Anna Netrebko, Joyce DiDonato, and Ildebrando d'Arcangelo and is conducted by Antonio Pappano. Amazon has samples posted HERE. Because Amusements is in the outer lobby of McCaw Hall, this CD signing will be open to the public. Those who have tickets to the matinee on January 23 will be in the building anyway; but everyone is welcome. Yes, Larry Brownlee is THE Rosini singeer of this (and possibly many other) generation!! Netrebko should consider it a privilege to be on the same CD with Larry! !